The Schmersal Group exhibits innovating safety systems for complete plants and complex machinery at this year’s Motek. These solutions meet essential requirements of Industry 4.0 concepts and can be adapted easily to varying applications. They enable preventive maintenance, increase productivity and efficiency and at the same time ensure a high safety level. The new AUX variant of the AZM 300 AS, a solenoid interlock with integrated AS-i-Safety-at-Work interface, achieves the highest safety level PL e with the safe two-channel release function. Therefore, it is worldwide the first AS-I solenoid interlock which meets all user requirements of the ISO 14119 standard. Thanks to the integrated RFID technology AZM300-AS achieves the coding level ‘high’ thus ensures a high protection against manipulation according to ISO 14119. Apart from the AUX power version the AZM300 solenoid interlock is also available in the AS-i power variant. 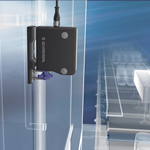 The fieldbus standard AS-i is used to connect non-safe as well as safe switches, sensors and interlocks in a simple and cost-effective way. AS-i safety solutions therefore offer a variety of diagnosis options and enable early fault detection for instance. This is an important feature in terms of preventive maintenance and industry 4.0. AS-I-Safety-at-Work also allows for individually scalable safety solutions for different machine sizes with simple and fast assembly. The Schmersal Group expands its AS-i program continuously, offering a very comprehensive range of safety components with AS-i interface. This entry was posted in News and tagged Industrial, Safety Systems. Bookmark the permalink.